Our customer is our main concern, and is always treated with the highest respect. Our commitment is to ALWAYS provide the best possible automotive service. At GK Tire & Auto our Customer is our main concern. We are honest in our every endeavor, our Customer is always to be treated with the highest respect and our Commitment is to ALWAYS provide the best possible service. Selecting the right tires for your vehicle is an important decision. Your safety, as well as driving enjoyment over the next years and thousands of miles will be determined by this decision. We provide expert information and the advice/recommendation which will ensure you select tires that match your vehicle…and the way you drive! Since tires affect the personality and performance of your vehicle, all four tires should be as identical as possible or handling problems may arise. If your tires don’t match; it is possible that one end of your vehicle won’t respond as quickly or completely as the other, making it more difficult to control. If two of your tires have a lot of remaining tread depth, but you need to replace the other two because they were damaged or have worn out, you should replace them with a pair of tires that come as close to possible to matching your existing tires. While identical new tires are desirable, others of the same size and type can also provide good results. Only consider selecting new tires that are from the same tire category as your existing tires. New tires should be installed on the rear axle. Many customers underestimate the value of regularly maintaining their vehicle. Whether you own a car, truck, SUV, or mini van, they all need regular checkups by trained and experienced technicians to ensure that all parts are in working order. 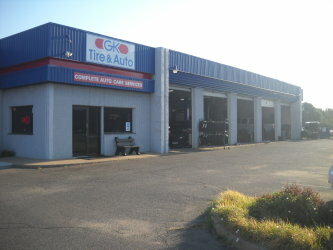 At GK Tire & Auto; we do it ALL!